Beta Company was the second class of soldiers generated by the SPARTAN-III program. The formation of the company was authorized in 2537 and built upon experience garnered from Alpha Company. Ultimately, most of Beta Company perished during Operation: TORPEDO in 2545. Beta Company was succeeded by Gamma Company. The authorization and funding for Beta Company came in the wake of the destruction of Alpha Company during Operation: PROMETHEUS in 2537. While the loss of the lead company was unfortunate, Alpha's impressive combat record clearly made the SPARTAN-III program worth pursuing. Beta was projected to produce 1000 soldiers. However, even using expanded selection criteria the number of candidates found with suitable genetic characteristics made this impossible. On the positive side, lessons learned from Alpha made it possible to graduate a larger proportion of recruits. As with Alpha, then-Lieutenant Kurt Ambrose and Senior Chief Petty Officer Franklin Mendez were again charged with training Beta. 418 candidates gathered at Camp Currahee, Onyx. The camp was supervised by the AI Deep Winter, replacing the previous AI Eternal Spring. After-action analysis of Operation: PROMETHEUS resulted in an increased emphasis on unit cohesion during training. The vetting process to select 300 for augmentation was ongoing in 2541 and involved an array of unconventional training exercises as well as strenuous theoretical studies under Deep Winter every night. 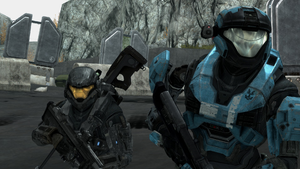 While the AI criticized the harshness of Ambrose's training regimen, Kurt was confident it was necessary to ensure the Spartans could endure the stress of a live combat situation. The 300 Spartans of Beta Company graduated at some point prior to May 2545 and participated in an unspecified number of engagements, including Operation: CARTWHEEL. Unlike Ackerson, who was quite prepared to see every one of the Spartan-IIIs trained die if an appropriately high-value target could be found, both Kurt and Mendez tried to extract as many personnel as they could to stop them from being wasted on suicide missions, as almost the entire company would be in Operation: TORPEDO. Ambrose believed that approximately 1.08% of the company could be absorbed into base personnel before TORPEDO due to the operation's expected high death toll. SPARTAN-B312 was deployed alone immediately after training, although Kat-B320 was more difficult to extract after Operation: CARTWHEEL. Similarly, Kurt attempted to send SPARTAN-B170 and B091 on deep-space reconnaissance to avoid being sent as part of the TORPEDO assault force, although this attempt was unsuccessful in Lucy's case. All of these Spartans were deemed in some way exceptional among their peers and thus too valuable to be wasted on suicide missions; many were later equipped with MJOLNIR Powered Assault Armor rather than the cheaper but less effective SPI, and deployed on missions more befitting their Spartan status, rather than the suicide missions they had been trained for. All of these extractions would result in Beta Company Spartan-III personnel surviving to fight in the Human-Covenant War, outside of Ackerson's chain of command. Three hundred soldiers of Beta Company were inserted successfully via stealth drop pods onto Pegasi Delta on 3 July 2545 at 1135 hours. Their objective was to destroy a Covenant deuterium/tritium fuel refinery. Nine soldiers dropped out of contact immediately after touchdown for unknown reasons. The remainder proceeded toward the objective on foot, and were engaged by Covenant forces that reacted with unexpected speed and strength. As the soldiers reached the refinery complex the source of the Covenant response became clear. Seven enemy cruisers were on station and had escaped detection by UNSC reconnaissance satellites. In the face of such overwhelming force, an Omega Three code was issued and Beta was ordered to retreat. Team Foxtrot ignored the order and continued to the objective and destroyed the refinery with heavy losses. The resulting explosion destroyed everything within a four kilometer radius, including all Covenant forces and the rest of Beta Company. The only known survivors the operation were Lucy-B091 and Tom-B292 of Foxtrot, who leaped into the nearby ocean to escape the blast and managed to pick their way to a Black Cat exfiltration craft. The destruction of Beta Company would drive Kurt Ambrose to greater efforts to perfect its successor. As a result, Gamma Company received illicit drugs during augmentation to make them more resistant to pain and shock. Beta Company was issued Mark II Semi-Powered Infiltration armor, an upgrade from Alpha Company's Mark I. Their main service rifle was the MA5K carbine, an MA5 series variant intended for special forces use. The 300 soldiers of Beta Company mirrors the strength of the 300 Greek Spartans at the Battle of Thermopylae. Similarly, the 300 Spartan-IIIs of Beta Company only yielded a few survivors, just as two of the 300 Spartans at Thermopylae returned home to Sparta. Italics denote that a unit has been destroyed or disbanded, or that its whereabouts are unknown.